A group of experts is revitalizing stained-glass depictions of holy figures at a former Dubuque church. With brushes and chisels, workers at Steeple Square have labored to give new life to Mary, mother of Jesus, and other saints adorning the windows of the former St. Mary’s Catholic Church. The former church campus now is home to Steeple Square, located at the intersection of 15th and White streets. Leaders of the nonprofit board have been working to revitalize the historic structure to create a community space, housing for low-income families and more. 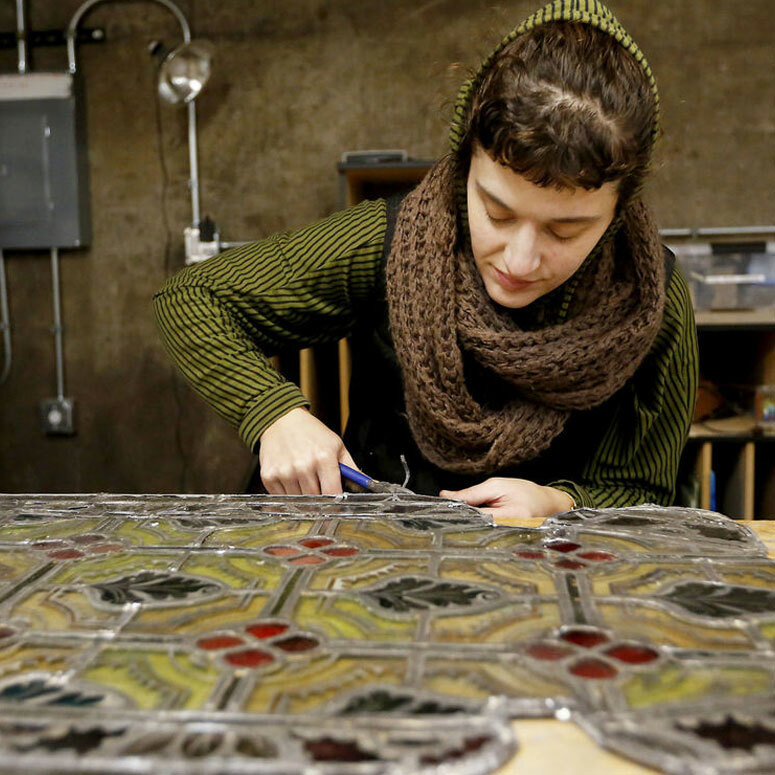 Now, in partnership with several organizations, Steeple Square officials are working to have the century-old stained-glass windows cleaned and restored. Work on the windows is being led by Heritage Works Dubuque. Duane Hagerty, CEO of Heritage Works, said a team of eight people has been working for seven weeks to repair two windows that sit above the side entrances, along with two larger side windows. Hagerty said the project has enough funding to restore four additional side windows as well. Work likely will be completed in the spring. The total funding for the project is $200,000, which comes from a combination of grants and personal donations. The windows were placed in the church in 1916 as part of a massive renovation that began in 1912. But they’ve largely been untouched since then, accruing plenty of dirt and wear along the way. Each window is removed from its frame and then soaked, cleaned, repaired and polished. Hagerty said the frames also will be repainted, but he noted that they are still in good shape, despite their age. Hagerty said he hopes to raise enough funding to eventually have all of the stained-glass windows restored. For some, the project is an educational experience. Hagerty said three of the crew members had no prior experience in stained-glass window restoration and were brought on to learn about the practice. Stedman Foster is one of the workers being introduced to the skill. He said he jumped at the opportunity to learn more about pieces of art he has always admired. Foster said he has been fascinated to learn about the history of the church and the stained glass. He hopes the project can extend the life of the windows so future generations can appreciate them as much as he does. As published in Dubuque Telegraph Herald. View article here.